Chief factor of the Hudson’s Bay Company at Fort Vancouver, philanthropist, and founder of Oregon City. The land on the east bank of the Willamette River at the falls was claimed by Dr. McLoughlin and the Hudson’s Bay Co. in 1828-29. First called Willamette Falls, the town was platted in 1842 and was named Oregon City by Dr. McLoughlin. Oregon City was the first incorporated U.S. city west of the Rocky Mountains, 1844. Provisional and Territorial Capital-1843-52, and the continuous Seat of Government for Clackamas County since 1843. 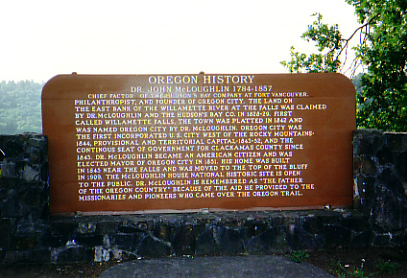 Dr. McLoughlin became an American citizen and was elected Mayor of Oregon City in 1851. His home was built in 1845 near the falls and was moved to the top of the bluff in 1909. The McLoughlin House National Historic Site is open to the Public. Dr. McLoughlin is remembered as "The Father of the Oregon Country" because of the aid he provided to the missionaries and pioneers who came over the Oregon Trail.